With all that has happened in my life this past 12 months I am learning that what I thought was simple was not as simple as it could be and I long to live a much more simpler life than the one I currently have. I want to look around me and see beauty and not rushed, hurriness of a too-busy life that forgot to breath that day. 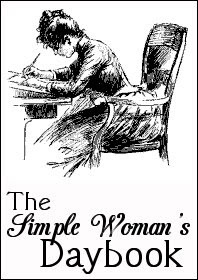 My dear sister in Christ, Adeye, directed me through her post to this lovely idea of The Simple Woman's Day Book. What a simple journal idea, to keep the simple things important things and worthy of reflection. Outside my window... It is a breezy and beautiful 75 degrees. The wind is blowing through the palm trees in the front yard and but is barely moving the tall pine woods in the back yard, where the birds and squirrels play all day. I am thinking... about the peace that comes to my family really starts with me. How I choose to respond or how I choose to show mercy sets the tone for my children, my blessings from the Lord. I am also thinking about how hopeful my husband and I have become. We have learned so much these past 12 months. On Mondays the Lord gives us hope for that week, each morning we have hope for that day. We are learning to walk truly, truly one day at a time (sweet Jesus, one day at a time). From the learning rooms... Autumn seems to have mastered her basic shapes. We are so proud since she is 5 years old and has really struggled with even the simplest things since we adopted her almost 3 years ago now. I have learned that Kya is struggling with a math concept. She is wonderful at math, does wonderful equations and writes her numbers well and yet I just discovered she can't really "read" her numbers. She can "read". She's reading words though, not numbers. If the numbers are in a sequential order, she can read them but hold up "19" or "23" individually and she struggles. Back to the basics of 'reading' numbers with her. I am thankful for... 7 months of my husband being home with my children and I. This is a gift of time that soon will slip away and become part of our history. I want to hold onto it and cherish this time while we still have it together. From the kitchen... the pots are out and ready for a family favorite dinner to be made, spaghetti. We will all go to bed with very full stomachs tonight. I have learned to be thankful each day for the Lord's provision in this area for my family. I am wearing... blue jean carpi's and my favorite pink, soft-cotton, tank top and flip-flop style house slippers. 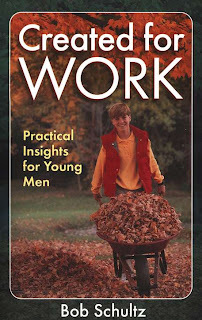 I am reading...Created for Work: Practical Insight for Young Men, by Bob Shultz ~ This book gives beautiful insightful tips for living with a simple soul and has proven not to be just for young men, but for everyone. I truly believe this book has made me a better person. I am creating... a new schooling and daily schedule for my children so that our home and life can run a bit more smoothly. I am hearing...my 5 year olds have a conversation in their bedroom about their baby dolls and my 1 year olds screaming with delight over a toy they are playing with together in their room. Around the house... three loads of laundry are needing to be folded and put away, one of them is clean towels. I love folding the fresh warm towels. Toys are scattered through my living room as my four children run through and play with them and then run back to their own rooms to play with something else. I stand in agreement with my friend, Adeye, that I count it a blessing, a higher calling, to serve my family in this manner. One of my favorite things... the way my house looks each night before I go to bed. It's all picked up and fresh looking and the memories from that day trickle in the air and are already moments we can't retrieve but will live in my heart forever. A few plans for the rest of the week... to spend my birthday with my amazing husband, my wonderful four children, my beautiful mother, my beloved step-father, my incredible little brother and spirited baby sister. And even an afternoon date with my dear husband, while my sweet mom and step-father watch all six children. Here is a picture thought I am sharing with you... it is of the book I am reading. I truly love this simple book.